Pierre Sauvageot has had an eclectic musical career, which has inspired him to use urban living as the content, context and concept behind his work. After playing in radical brass bands in the 1970s and ten years of free jazz and trumpet, in 1983, he paired up with Michel Risse to create Décor Sonore, which became a vehicle for a host of artistic adventures, including the Ballet mécanique pour hélicoptères et engins de chantiers, Grand mix (featuring Les Tambours du Bronx, Bulgarian voices and a Philharmonic orchestra), Corps Sonores and Octuor de mégaphones. At the same time, he supported the productions of choreographer Jany Jérémie (Black Label, J’voudrais être blanche, Kiosque Nègre, etc.). He worked alongside Serge Hureau (Gueule de Piaf, Au Bon petit Charles), Oposito (Transhumance) and Toni Casalonga (Voce in Festa). He then moved outdoors for good, deciding to dedicate his work to public space, with Allegro Barbaro, where 100 amateurs played the moped or car horns, Le Concert de public, performed by the audience themselves, and oXc [Odyssée], an urban and Mediterranean opera for large public squares. Champ harmonique (Harmonic Fields) is a symphonic march for five hundred wind instruments and a moving audience. 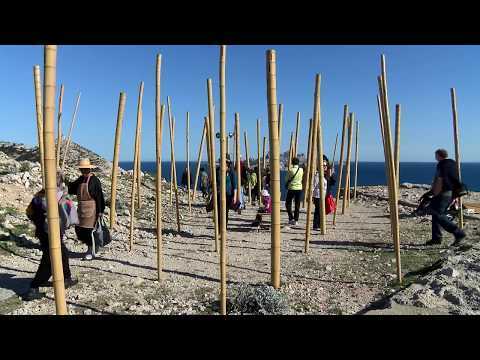 It was created in 2010 in Martigues and has been presented across Europe in Grenoble (FR), Oerol (NL), Copenhagen (DK), Marseille (FR) (as part of Marseille-Provence 2013, European Capital of Culture), Helsinki (FL), Ulverston (UK), Portland (UK), Graz (AT) and Benk (B). In 2013, Pierre Sauvageot created Igor Hagard, un sacre ferroviaire (Igor off the Rails, a railway rite), a stationary musical journey on a station platform using a rearranged score from Igor Stravinsky’s Rite of Spring. Pierre Sauvageot is currently working on his latest creation, “Grand Ensemble”, a divertimento for apartment blocks with a symphonic orchestra. Since 2001, Pierre Sauvageot has managed Lieux Publics, the French national centre for art in public space, in Marseille. In 2003, Lieux Publics founded IN SITU, the European network for artistic creation in public space, which it has since coordinated. The network was extended by the IN SITU Platform project in November 2014. Lieux Publics offers support to artists from all disciplines who seek to make urban areas the location, subject and object of their work. Lieux Publics focuses on the fundamental issue of new urban creation, developing complementary initiatives around three key areas: the European dimension; a national reference centre for creation and research, with artist residencies, commissions, the Remue-méninges workshop, the Carnets de Rue collection and the manager’s creations; and the invention of new public events in Marseille and across Provence, with the urban ritual Sirènes et midi net or even Métamorphoses, a major event of Marseille-Provence 2013, European Capital of Culture, and European events (such as Travellings, Platform, etc. ).